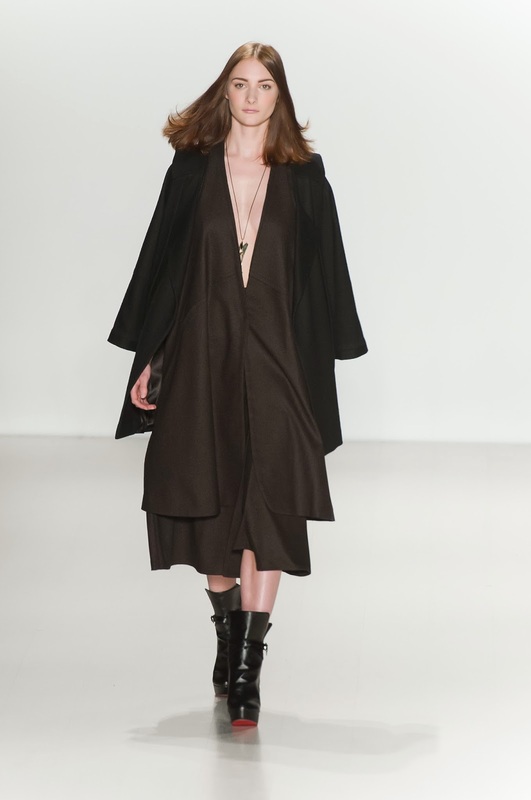 Brazilian menswear design Ivan Aguilar debuted his first women’s collection this season at New York Fashion Week. The 30-look presentation featured exaggerated collars, flared minis that accentuated the waist, and shawls that were far more formal than any shawl I've ever tossed round my shoulders. The palette was muted but not dull, as copper, gold, and shimmering navy were interspersed throughout with more neutral hues. My favorite combo paired a navy and gold silk blouse with an ornate Baroque print and flattened cowl neckline over a flared wool skirt. I say yes to this look all day, every day – at the office, on a dinner date, or a formal evening out. All photos by Mercedes-Benz Fashion Week. Tokyo’s design school, Vantan, rejoined the Fashion Week line up with partner company PARCO for the Asia Fashion Collection. Showcasing budding designers from Asia, on view was a great range of talent from street style to avant-garde pieces. "Vianad," by Maaku Suzuki, presented an elegant, romantic ready-to-wear collection with blush tones and feminine pieces. "R-Shemiste" fused trendy street style and sportswear, and "Hang" focused on a minimalist look with asymmetrical drapery. Beautiful leather and fur combinations were prominent at "Is," and sophisticated yet futuristic silhouettes impressed at "Austin." Yumiko Sei of "SEi," my personal favorite designer of the night, was the most couture-like line of the night. Standout knitwear, intriguing shapes, and one-of-a kind accessories led to an incredibly fascinating collection.